Two to three days before roasting: Begin thawing the turkey in the refrigerator or in a cooler kept at 38 degrees F.
The night before you’d like to eat: Truss the legs of the turkey with kitchen twine if desired. Combine the brine, water and ice in a 5-gallon bucket. Place the thawed turkey, with innards removed, breast-side down in the brine. If necessary, weigh down the bird to ensure it is fully immersed, cover and refrigerate or place everything in a cooler. Turn the bird once halfway through brining. Day of roasting: Heat the oven to 500 degrees F. Remove the bird from the brine and rinse inside and out with cold water. Discard the brine. 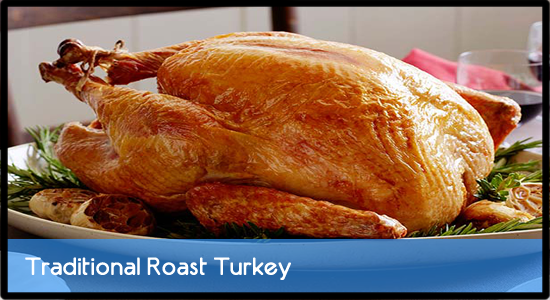 Place the bird on a roasting rack inside a half sheet pan and pat dry with paper towels. Rub the bird with canola oil. Roast the bird on the lowest rack of the oven for 30 minutes. While the bird is cooking, fold and shape a double thickness of aluminum foil into a closely fitting breastplate. After 30 minutes, decrease the oven temperature to 350 degrees F, insert a probe thermometer into the thickest part of the breast and cook until the temperature reaches 155 degrees F. Use the breastplate at any point during cooking should the bird become too brown. Rest the bird, covered lightly with aluminum foil, for 15 to 30 minutes. Carve and serve.